When Nick and I visited New York City a few months ago, we of course had to seek out the best bagels in the city - and ever since then, I've been craving the real deal. 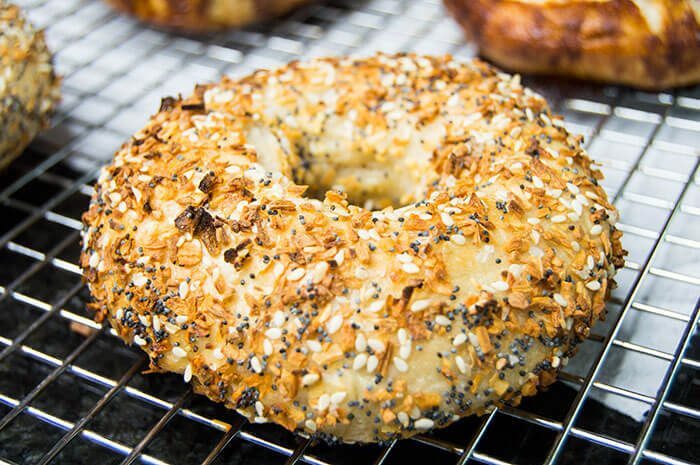 Store bought bagels simply do not compare. Fortunately, bagels are surprisingly easy to make and even more fun to customize with your favorite flavorings. Personally my favorite kind is 'everything,' but I've been known to smash on some cinnamon crunch bagels - and it's hard to go wrong with classic egg wash. The most important part of the bagel, aside from the toppings of course, is the dough and how it's made. 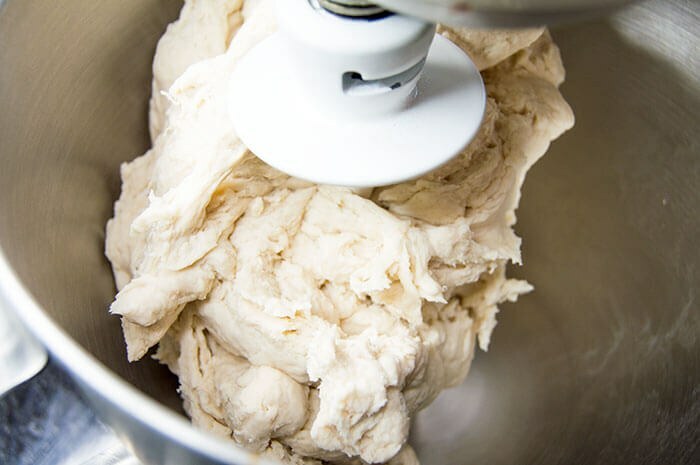 Bagel dough can get tough to stir by hand, so I recommend using a stand mixer with dough hook for optimal results. At the beginning, the sticky dough seems like it'll never come together. But after some time, a thick, sturdy dough forms. It'll take about eight to ten minutes to fully develop. After that, I took mine off the hook and hand kneaded it until it was nice and smooth. 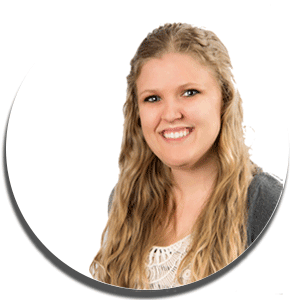 Kneading dough can definitely be a great upper body work out! You'll know the dough has been worked enough when you can tear of a small piece and stretch it until light can be seen through the dough. If it rips before that point, it needs to be kneaded some more. It's also important to let the dough rest and rise for a good amount of time before punching it down. This is what makes bagels airy - with medium to large bubbles throughout the dough. Next, I separated the dough out into even sized pieces. My 'fool proof' way to do this is to just cut the whole dough ball in half, then cut each half in half again, and repeat until I have enough evenly sized chunks to make my bagels. You should end up with about a dozen. There are several ways to make bagels - the most authentic being rolling the dough into snakes then connecting each end. Another method is to just poke a thumb through the center and form into a reasonable circle. 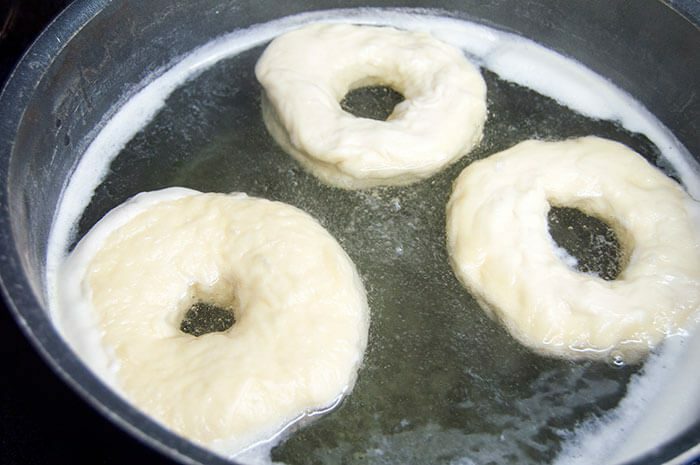 Bagel dough should first be boiled in a mixture of honey and water until they are puffy. In my picture above the two rings on the right used the 'roll into snakes' method, whereas the large one on the left was 'poking a thumb through the middle' - as you can see, they result in various sized bagels. The final step is to give all the bagels a generous egg wash then pile on the toppings. 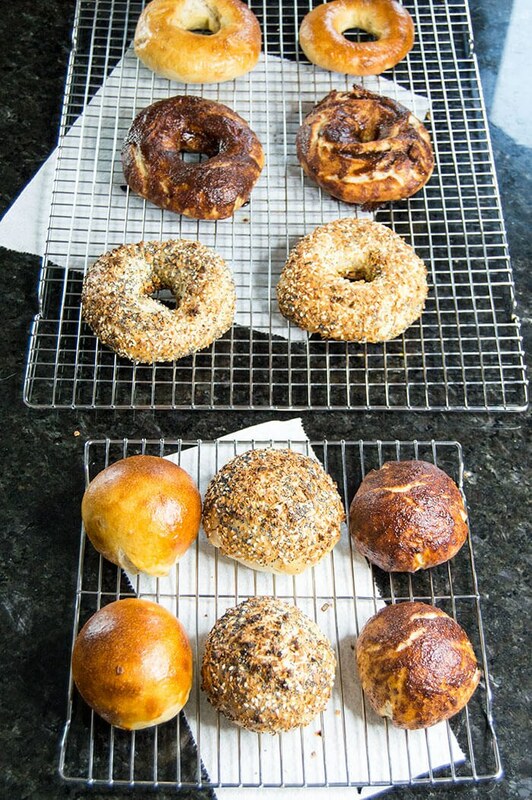 I created three different bagel styles for mine, including an 'everything' mix and cinnamon sugar. 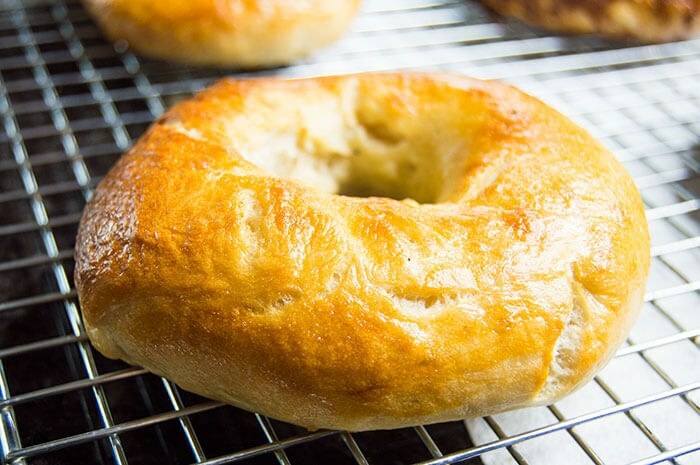 Bake the bagels until they are browned and puffed up. Trust me, your house will smell amazing at this point - like a bonafide bakery! Of course, I also made some cream cheese stuffed bagels, in true Starving Chef fashion. 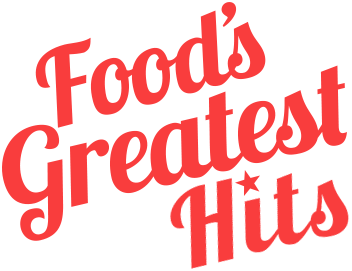 Read the recipe here! 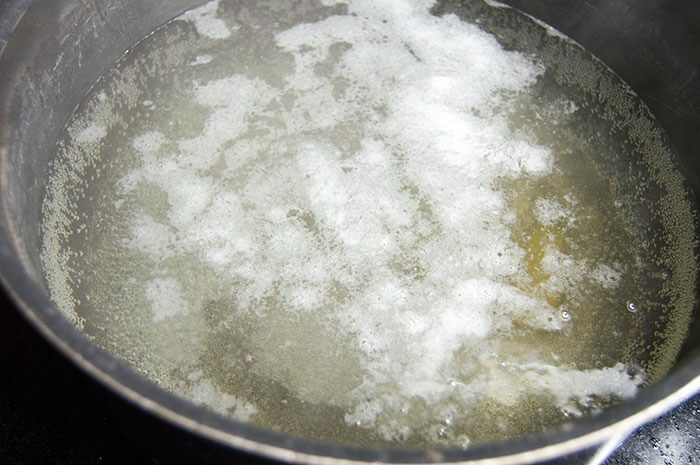 In the bowl of a stand mixer, whisk together the flour, sugar, sea salt, oil and yeast. 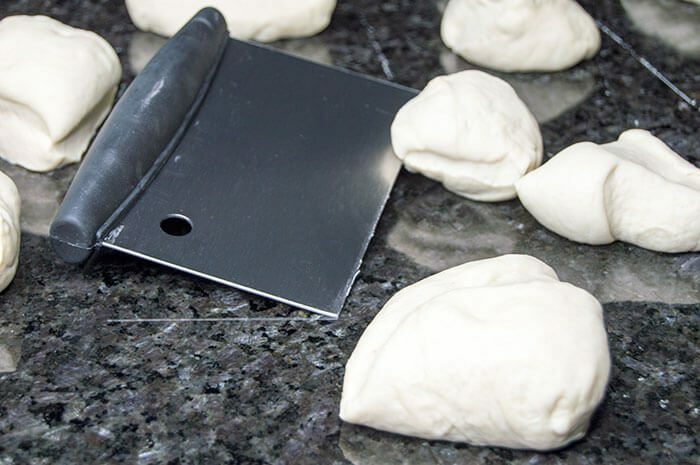 Attach a dough hook to the mixer head. Stir on a medium-low speed while slowly pouring in the water. 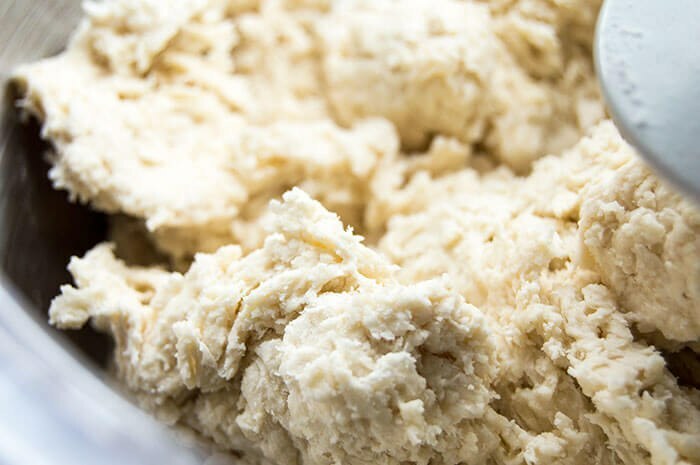 Once the water is completely mixed in and a sticky dough has formed, turn the mixer up to medium and let it go for about 8-10 minutes. The dough will look like it is not coming together at first. 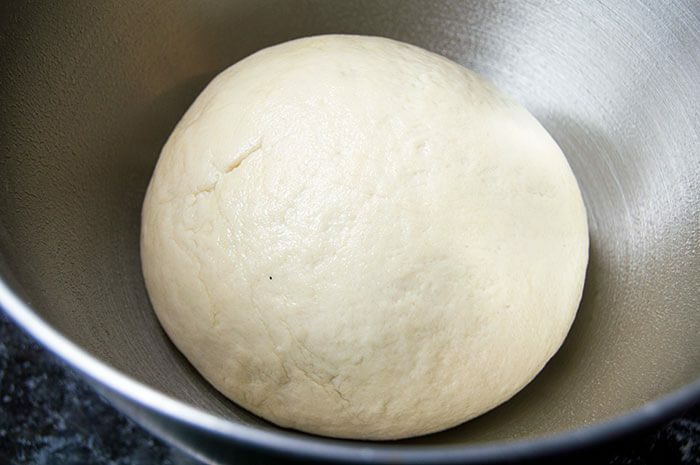 If AFTER the initial 8-10 minutes the dough is too dry, add more water as needed. If AFTER the initial 8-10 minutes the dough is too wet, add in more flour as needed. 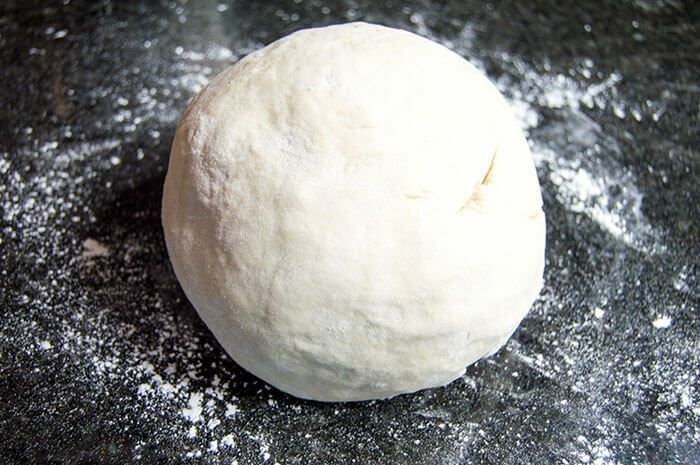 When a firm but slightly sticky dough has formed, turn off the mixer and roll the dough out onto a floured surface. Continue to knead the dough by hand for another 10-25 minutes, until the dough is smooth. To tell if the dough is ready, pull off a quarter sized piece. If it can be easily pulled until transparent to light, it is ready. If it rips, continue to knead until the transparent test works. 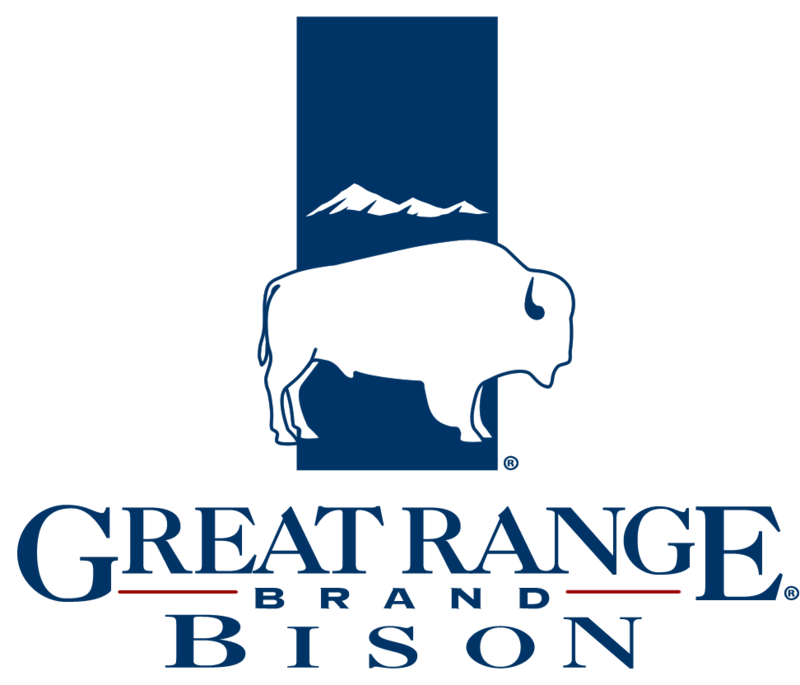 Lightly grease a large bowl with oil. Place the dough in the bowl and cover with plastic and a towel. Let the dough rise for two hours. After two hours, punch the dough down and divide into 12-13 evenly sized pieces. Arrange on a baking sheet and cover with plastic wrap and a towel. Let rise about 25 more minutes. Use your hands to roll the dough balls into snake/log shapes. Connect each end to form a ring. 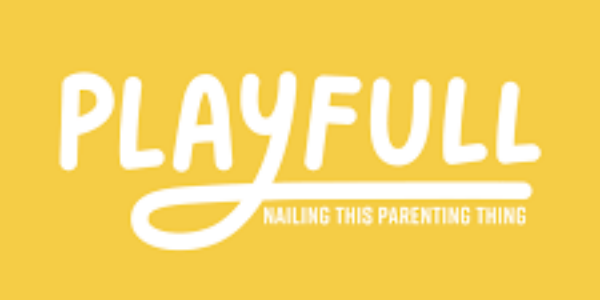 Alternatively, form the dough in a ball, flatten slightly then poke your thumb through the center. Cover and let rise while preparing the next steps. In a large pot, add about 4-5 inches of water then pour in the honey. Bring to a boil. Preheat the oven to 425 F. In a small bowl, large enough to hold a bagel, stir together the ingredients for the "everything" bagel mix. 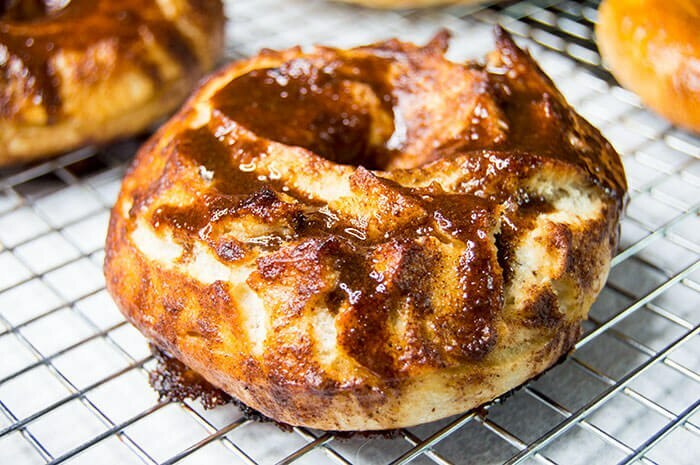 In a separate bowl, whisk together the ingredients for the cinnamon sugar bagel mix. In another bowl, whisk together the egg and water to make an egg wash.
Add the bagels to the boiling water, about 2-4 per batch (however many your pot can hold without the bagels touching). Boil for 1-2 minutes per side, until the bagels are puffed up. Remove the bagels from the water with a slotted spatula (or very gently with tongs or chopsticks) and place on a parchment or silicone lined baking sheet. Let dry for about 5-10 minutes, until no longer visibly glistening with water. Brush the egg wash onto each bagel then place the bagels into the "everything" topping or the cinnamon sugar, as desired. Cook any dipped in cinnamon sugar on their own baking sheet - the butter will melt and spread across the pan. 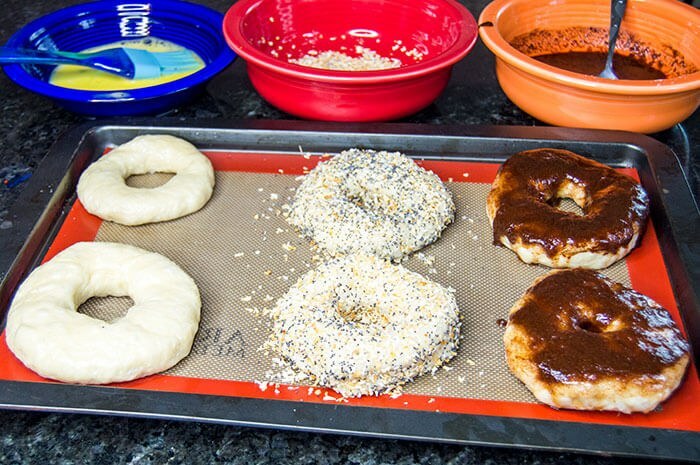 Arrange the bagels on a baking sheet lined with parchment or silicone and bake for 15-25 minutes, until the bagels are golden brown and puffed up. Remove from the oven and let cool on a rack until warm or room temperature. Serve with your favorite cream cheese, peanut butter or whatever you desire. Enjoy!